Ready to learn more about draw a pinup girl? You’ve done all of the main drawing and now it’s time to add in a little bit of final detail to finish off the sailor girl. You need to look at the whole image and then focus on the areas to finish and improve. Along with darkening some of the outer lines you’ll also be adding in shading. In this image you can see a little bit of ‘Rim Lighting’ which refers to light that seems to be coming from behind the character that causes the sides to have a bit more lighting to them. Wikipedia has some great additional information on how Rim Lighting works if you are interested to read more. 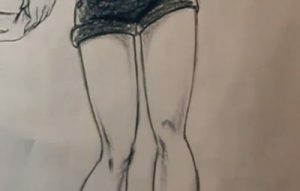 Now, for the next part of our guide to how to draw a pinup girl, focus on the details of the legs and the shading for the knees. Also, look at how the shorts would cast a shadow on the upper leg in your image. Do some light shading to enhance the legs. The last thing to add to this drawing is the ground plane. When learning how to draw a pinup girl, it’s always a good idea to indicate a surface that your character is standing on. 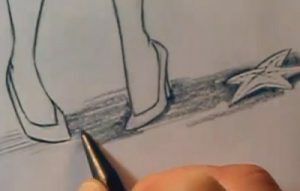 You can achieve this by adding a little bit of shading around the feet. You can see that a starfish was also added to the ground plane to help enhance the sailor theme of the drawing. We hope this tutorial has helped you draw a pinup girl. Why not check out our other lessons?